The Rock Solid Whole Body Vibration Machine is designed for those who want to get a full body workout or find relief from pain. The vibrations on the machine work to increase muscle strength by forcing your body to stabilize while on the machine. Circulation is also stimulated which can speed up healing time and reduce chronic pain. Anyone can use a vibration machine, whether you are an avowed couch potato or an avid athlete. Let’s look at the what the features and benefits of the Rock Solid Whole Body Vibration Machine. 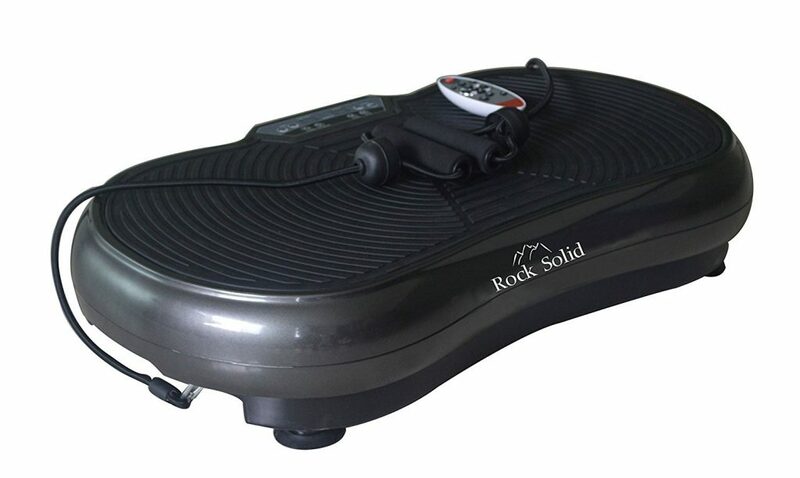 The Rock Solid Whole Body Vibration Machine provides the equipment for a full body workout. In addition to the platform, the machine comes with a full set of resistance bands and a workout poster. The bands offer a variety of resistance, so you can work as hard or easily as you like. The bands are color coded, so you always know which one to grab for each exercise. The bands also connect to the machine, so need to worry about accidentally slipping and getting a band in the face. The poster also shows a variety of moves you can do on the machine. You can do them as shown or modify to fit your fitness level. One of the great benefits of vibration platform machines is that they provide pain relief. Vibration therapy is used by doctors and physical therapists to help patients who are recovering from illnesses or injuries back on their feet and living a normal life. The vibrations of the machines stimulate your muscles without you having to work as hard. This will increase healing time as well as force your body to circulate more blood and fluids. Vibration therapy can also increase the production of cells that build bones. This will also heal pain and increase strength for those who have lost some abilities through old age or illness. There are not a lot of bells and whistles to the display of the Rock Solid Whole Body Vibration Machine. Each unit comes with a remote control so you can change settings while on the machine or have a friend do it for you. There are 99 levels of vibration available, so you can always find a setting that is comfortable for you. The hertz range from 0 – 30, which means the vibration can get pretty high, but not so high you cannot think straight. You can also easily set the timer for each workout. Rock Solid recommends 10 minute sessions to get the full benefits from the machine. 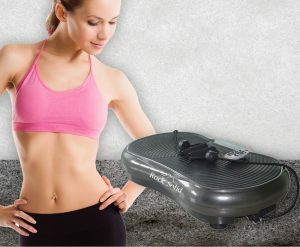 If you are unsure of whether to invest in the Rock Solid Whole Body Vibration Machine, the company offers two choices to ensure your satisfaction. There is a 14 day money back guarantee if you find that you simply do not like using a vibration machine. (You will have to pay return shipping, though.) There is also a two year parts and labor warranty, which is a pretty generous warranty in the vibration platform market. If you suffer from chronic pain, then consider the Rock Solid Whole Body Vibration Machine. By doing gentle stretches while on the machine, you can relieve pain and speed up the recovery from any type of injury. The increase in blood flow and muscle strength will also help you get back on your feet and be in better shape than you were before! If you are not injured and just want an affordable vibration platform with an excellent warranty, then this machine is perfect for you. You can use the included resistance bands to get a full body workout in just 10 minutes a day. You should feel and look better within three weeks. At this price point, it is worth a try.